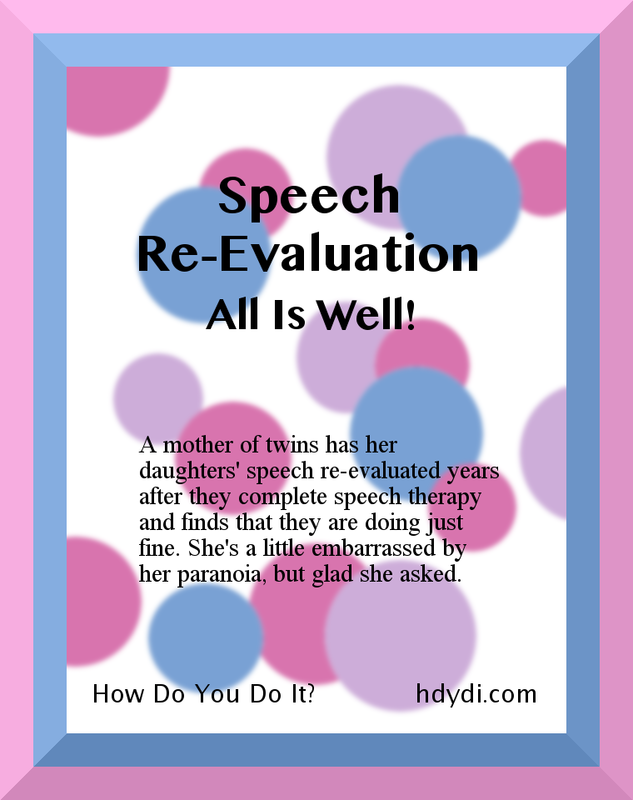 Speech Therapy Archives | How Do You Do It? Speech Re-Evaluation: All Is Well! My twin daughters received speech therapy at age 4 and it made a world of difference in their ability to be understood. When they graduated therapy after a few months, the therapist told me watch out (listen out?) for the development of their /r/s. She didn’t anticipate any issues, but told us that /r/ would be the next thing to look out for. Since English-speaking kids don’t typically develop the /r/ sound for several years, we might notice delays down the road. They had all their other consonants down, although M was still working on a lisp-free /s/. Now that M and J are 7.5 years old, they’re at the age where I anticipated they’d start to have more adult like articulation. When they told me that friends at school were commenting on their accent—they’ve lived here in Texas all their lives—I thought a speech evaluation might be in order. They do odd things like pronounce “shorts” and “shirts” as homonyms, which causes much confusion when we’re getting dressed in the morning. According to our eligibility guidelines, an English /r/ is not typically mastered (i.e. produced correctly by 90% of population) until age 7.5 (based on the Massachusetts Speech and Hearing Association Entrance and Exit Criteria Guidelines), so it would not be considered “significantly delayed” (which is the criteria for school-based therapy) until the age of 8.5 or 9. For Spanish /r/, the age of mastery is 5 for tap-r and 7 for /rr/. However, with the girls not being native Spanish speakers, we would not work on Spanish /rr/ in school-based therapy. After some back and forth to give her official permission to talk to my girls, I received the following email. I just pulled your girls for a brief conversation in the hallway after their TAG [Talented and Gifted] class. What charming children! So verbal. J has no noticeable sound errors, and M has a slight, developmentally-appropriate distortion of /r/. She is stimulable for /r/, which means that if you show her and tell her how to do it, she is able to be taught. I say, “Pull your lips back like you’re smiling, then pull your tongue waaaay back to the back of your mouth and say RRRRed.” With this type of instruction, she is able to approximate the /r/ sound. This means that she will likely acquire the sound on her own without intervention. At this point I would definitely say that there is nothing to worry about and you should be very proud of your lovely daughters. Do I feel a little silly about having worried? Yes, I admit that I do . Still, I’m so glad I asked. I did make a mistake, though. I failed to tell my girls that I’d contacted the speech therapist. When I asked J and M whether they’d enjoyed their chat with her, M told me that she was a little embarrassed. She was worried that I wasn’t proud of her speech. I told her that wasn’t it at all, that I had felt terrible about delaying her evaluation the first time around and that I just wanted an expert to tell me that everything was okay, which is exactly what happened. M was satisfied. I was reminded that my children are getting older and I need to be ever more transparent about how I advocate for them and talk to them about what I’m thinking and planning. Speech delays are more common with multiples that singletons. A review of studies on the subject indicates that prematurity plays a role in this. A bigger contributor is likely the social realities of being a twin. Twins get less time one-on-one with mom than comparable singletons. Instead, they spend time talking to mom and their twin at the same time. I’ve certainly observed my pair encouraging each other’s speech quirks… like the period a couple of months ago where they were convinced that “velvet” was a colour, what I would call burgundy. I actually had to pull out the dictionary to get them to realize that no one else had any idea what they were talking about. If you’re wondering about your own child or children’s speech development and how it compares to a typical kid’s, Katie over at Playing with Words 365 has written a clear and complete article describing the range of typical articulation development in English-speaking children. Have you ever had your children evaluated for their speech development? Been concerned that something might be wrong only to find that everything is fine? M has successfully completed two programs with a speech therapist, and we’re considering having her evaluated again. Twin sister J joined her for the second of those programs, and also benefitted greatly. Watching both my daughters work their way through speech therapy has taught me a few new things, and convinced me all the more of others. Some lessons are more likely to stick if they come from someone other than a child’s parent. There is such a thing as knowing too much about something. The first time we visited a speech therapist was at the recommendation of the family pediatrician. When M was nearly 3 years old, I became concerned about how slowly she ate. I once timed her spending 17 minutes chewing a single piece of meat, and finally had her spit it out. The pediatrician suggested that she had dysphagia, or trouble swallowing. I had imagined that a couple of degrees in linguistics gave me a basic understanding of what speech therapists do, but I was wrong. Speech therapists deal with all sorts of oral motor issues, including problems with chewing or swallowing. It turned out that M had never quite figured out how to use her tongue to effectively move food around in her mouth as she chewed. Because of that, foods that required chewing would cause her to choke. After six sessions of feeding therapy with an amazing speech therapist and a lot of reinforcement at home and daycare, she could eat successfully. Meals became enjoyable again. It’s been over 2 years, and we haven’t seen any backsliding. In fact, M enjoys food so much now that she plans to open a restaurant when she grows up. Bonus: military medical insurance covered 100% of speech therapy session costs. It was during feeding therapy that the therapist raised a concern that M might have articulation delays. It had never occurred to me that there was anything off in her speech, since the child talked incessantly and no one who knew her—I, her teachers, or our neighbours—had any trouble understanding her. I thought her pronunciation of yellow as “lellow” was darling, rather than worrisome. The linguist in me had always ignored the nagging doubts, knowing full well that there was variation in the timing of pronunciation mastery, but there should be no cause for alarm as long as the order of acquisition were being followed. When my husband returned from Iraq and needed me or J to translate for him so that he could understand M, it was clearly time to revisit the speech therapist. My MA in theoretical linguistics hadn’t taught me as much about the practicalities of language development as I’d thought. The practice we’d been to for feeding therapy no longer took our insurance, so we had to find a new therapist. We had both girls, now 3 months shy of turning 4, evaluated at the new practice. They ended up being evaluated by different therapists, and we learned how incredibly subjective these evaluations can be. J was determined to be 2 standard deviations above the norm for her age when it came to grammar, vocabulary and comprehension, but 2 standard deviations below the norm for articulation, the production of mature speech sounds. She sounded more like a child just turned 3 than one soon to be 4. M, on the other hand, was evaluated only for articulation, and declared to be just dandy. These results didn’t ring true for us. M was, to our ears, far less clear in her speech than J. My husband insisted that M be reevaluated, this time by the therapist who had seen J. When the office staff let us know that they were concerned that insurance might not pay for a second evaluation, we offered to pay out of pocket. Insurance did end up covering it, though. The second set of results was more in line with our expectations. Although J’s need for speech therapy was a judgment call, M definitely needed it. Where the first evaluation had her placed her in the 43rd percentile, the reevaluation placed her in the 2nd percentile for articulation. Since their delays were along the same continuum, the therapist offered to work both twins together in weekly sessions. The sessions were great fun for the girls. The therapist pulled out board games, and let them each take a turn after they completed a pronunciation exercise. She focused on making them aware of how the sounds coming out of their mouths were different than hers. Soon enough, they could say ‘sh’ and ‘v’ easily. It was extraordinary to see how those two sounds alone helped with others’ comprehension of their endless chatter. After 3 months, both the girls graduated from speech therapy. All J had left to master were ‘l’ and ‘r’, and the speech therapist didn’t think those needed to be rushed. M had a lisp to work on too, but we were comfortable with the exercises she needed to do at home to help with that. We should keep an eye on the girls, she told us, and consider revisiting a speech therapist if they didn’t appear to be making any headway after a while. My husband and I think that we’ve given it long enough, and both girls’ ‘r’s are still very baby-like. At this point, speech evaluations are often conducted through the school district, so we need to ask both their classroom teachers what they think of their speech before we go hunting for yet another speech therapist. 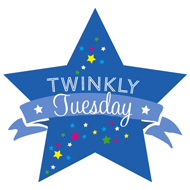 If you’re curious about what precisely goes on in a speech therapist’s office, feel free to peruse the detailed tales of feeding therapy and speech therapy sessions on my personal blog. Sadia and her 5-year-old girls, M and J, do their talking, lisps and all, in El Paso, TX, much to the exhaustion of her soldier husband. They try not to talk while eating, but it’s tough when there’s so much to say. They are happy to report that chewing challenges are no longer to blame for the length of conversations around the dinner table.